Ready for the hiking trip of a lifetime? How does a big hiking adventure in the Swiss Alps sound? I’m talking about experiencing jaw-dropping views of snow-covered peaks, hanging glaciers, and mountain lakes - all under your own power. I’ve worked with our local guide Doug to plan a trip that’s likely to ruin all future hiking adventures. He’s designed five signature day hikes for us. Each is unique, challenging, and utterly gorgeous. We visit three distinct regions, starting in the lakeside city of Lucerne in central Switzerland. Then we head deep into the Alps to base our stay in Zermatt, beneath the Matterhorn’s imposing silhouette. 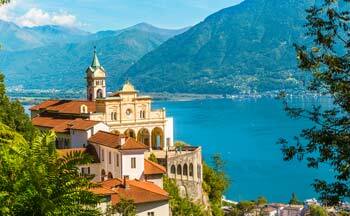 The trip concludes in Italian-speaking Locarno, Switzerland, along the breathtakingly beautiful turquois water of Lake Maggiore, before finishing in Zürich's Old Town. Join us and make your 2019 a year to remember! Register today! I (Matt Stan) would call the hiking intensity a solid 4 out of 5. You don't need to be a professional athlete, but you do need to be excited for a trip with big, challenging day hikes. Maximum of 10 amazing travelers. Small groups rule! Comfortable (but not opulent) 3-star hotels. We stay at locally owned hotels when possible. Likely not required. With an American or Canadian passport, you may visit Switzerland and European Union nations for tourism for up to 90 days in any 180 day period. This trip works well for couples, friends, and solo travelers. The adventures we plan seem to attract like-minded people. Odds are, you'll enjoy the company of your fellow travelers. Solo travelers will pair up to share double-occupancy hotel rooms. Prefer your own private room? It's an option for a $979 single supplement. $499 to reserve your spot today! Balance due 60 days before the trip. Possible change of plans? You can cancel for a full refund until 90 days before the trip. The Kapellbrücke (Chapel Bridge) in Lucerne, Switzerland. Mt. Pilatus near Lucerne, Switzerland. 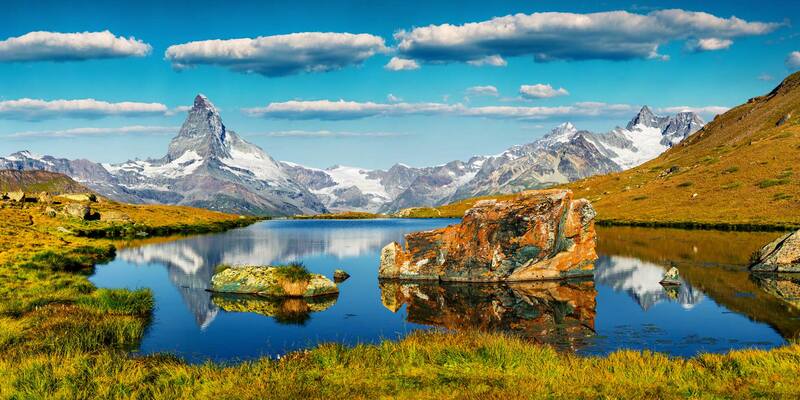 The Matterhorn near Zermatt, Switzerland. The Charles Kuonen Bridge, the world's longest pedestrian suspension bridge. 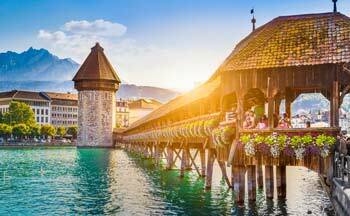 We'll all arrive independently in the beautiful historic city of Lucerne, Switzerland, at the edge of the Alps. Our friendly guide Doug will meet us at the train station. We'll drop bags at our hotel, enjoy free time to sightsee, then get to know one another at a group dinner reception at 6:30 PM. Mt. 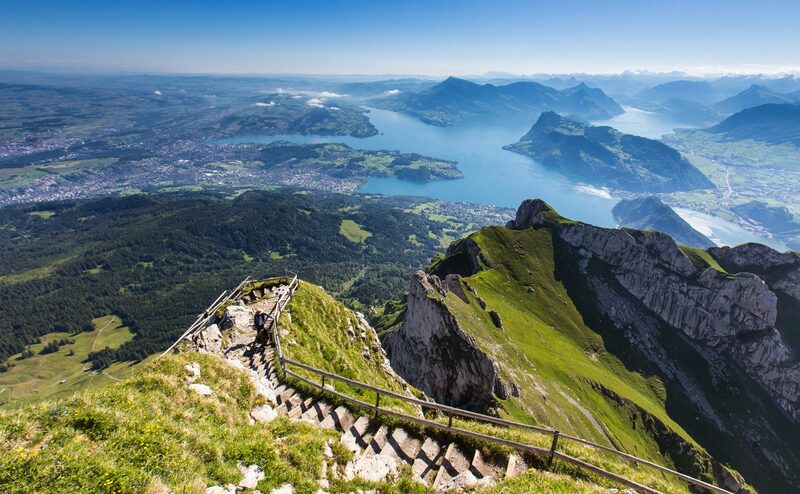 Pilatus - Big Hike! We head to our trailhead by crossing Lake Lucerne on steam ferryboat. (Seriously!) At the bottom of Mt. Pilatus we throw away our map and compass because the only direction we need to hike is up, up, up! We'll pass less adventurous tourists as we trek up more than 5,000-feet of elevation gain. A few hours (and many burned calories) later, we enjoy a scrumptious lunch on the Mt. Pilatus summit, survey snow-capped mountains behind us, and look down on the lake below us. Hopefully, no one notices our legs are quivering from the climb! With full bellies, we pass a picturesque alpine chapel as we stumble down the other side of the mountain. We finish the descent via gondola, then take a bus back to the city. If the hike sounds a bit too intimidating, it's possible to use a cog rail stop halfway up the mountain to reduce the amount of elevation gain. We depart Lucerne and head deep into the Alps on a scenic train journey to Zermatt. 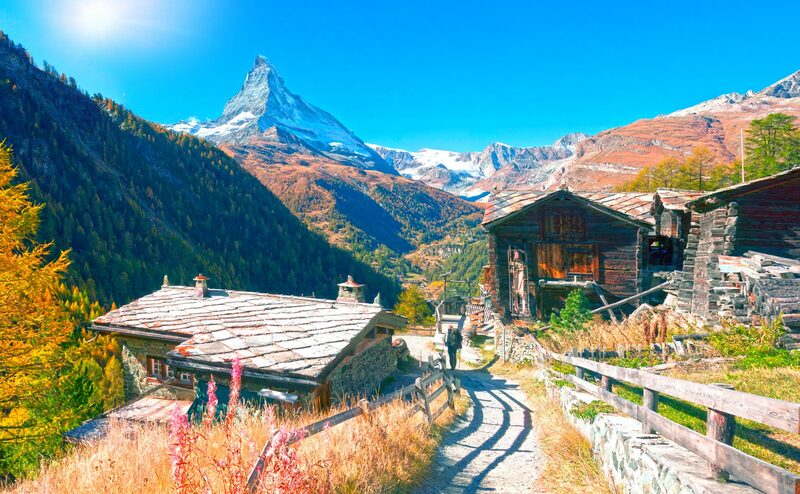 After checking into our hotel, we can explore the completely car-free town and take in views of the Matterhorn and its surrounding glaciers. We finish the afternoon with a lift ride to the Furi mountain station for a short hike. Best Hike of Your Life? Forget regular trains! This is Switzerland! We leave town via cog railway bound for the best alpine hiking of our lives. We tackle a loop hike that brings us to the top of Gornergrat ridge to reveal a panorama of 20 different 4,000-meters peaks! Our plan is to hike about 3,000-feet of elevation gain and loss, but there are options to use lifts and cog railways to tweak the intensity. Just when you think the trip can’t get any better, we take a brief train ride to Randa, then set off hiking through larch wood forests that open into more epic mountain views. Our destination? The world’s longest pedestrian suspension bridge! We sit back and relax for another scenic train ride. This time we head to the Italian-speaking part of Switzerland. 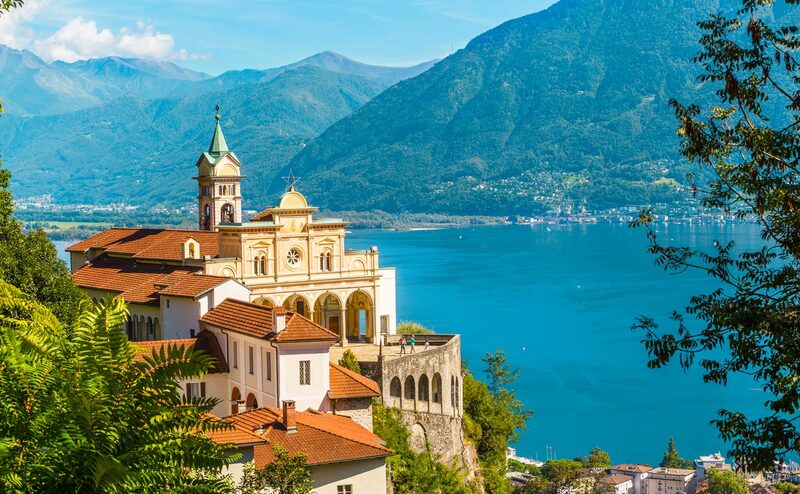 Once in Locarno, along Lake Maggia, we explore the historic fortress Castello Visconteo, check out ancient villages on mountain paths, and relax in this picturesque, slower-paced region. We set off on a train and bus to our trailhead across the Italian border. Our hike begins in the town of Lozzo and takes us through a rugged landscape full of mountain views. It feels like we’ve stepped back in time as we explore mountain villages, before completing our final epic hike with a bus and boat or train back to Locarno. We pack up and board the train to Zürich. On the way, we travel under the Alps, through the world’s longest tunnel. (It’s 35 miles!) After checking into our hotel, we explore Zürich's Old Town. We punctuate the trip with our final dinner together and reminisce about our adventures. All good things must come to an end. Shed a tear and plan to depart anytime. A curated itinerary of adventures, featurinig views of snow-capped peaks, hanging glaciers, and mountain lakes. This is about as far from a tour-bus experience as it gets! Big adventures deserve quality rest. We’ll stay in comfortable rooms in the heart of the cities we visit. Free admission to 500+ museums and significant discounts on optional cog rail and gondolas trips. Airfare and other travel expenses required to get to and from the trip; Travel insurance; Optional activities; Extra gondola or cog railway rides to reduce the intensity of our planned hikes (although discounted with the included Swiss Travel Pass); Trail snacks; All lunches; Dinners on nights 3 and 6; Guide gratuity. You'll get the most out of our adventure with a good base level of fitness. You don't need to be a professional athlete, but you do need to be excited to hike to some of the most beautiful spots in the world under your own power! Our guide Doug has planned a trip to excite people who love hiking. It really is for folks who like to go outside to play! Regardless of your fitness level, consider adding some training hikes with sustained climbs to your schedule in the weeks leading up to the trip. To be clear: if you want a tour bus trip, this isn't for you! Can I meet the other travelers on the trip? Absolutely! After you register, we’ll invite you to join a private Facebook group of the travelers on the trip. Is the trip guaranteed to operate? We need at least four travelers to operate the trip. However, I (Matt here!) don't advertise trips without the expectation of operating them. In fact, I've never organized a multi-day Bad Adventures trip that hasn't sold out. Just to be safe though, after registering, I suggest waiting a week or two before purchasing airfare. I'll let everyone know when we hit our four traveler minimum. Do be aware that The Bad Adventure Company LLC reserves the right to cancel trips. Be sure to review our Trip and Course Policies and consider purchasing travel insurance. How do I get to and from the start and end of the trip? If you're traveling from the USA or Canada, consider flying to Europe via Paris. It's usually one of the cheapest cities to arrive in and works well as a gateway for our trip. From Bad Adventures HQ in Colorado, I've had good experience with the inexpensive Norwegian Air nonstop flights to Paris' Charles de Gaulle airport. For the next leg, there are more than half a dozen nonstop flights from Charles de Gaulle to Zürich airport every day. The route is flown by both Air France and Swiss, takes about 1 hour 15 minutes, and tends to be reasonably priced. I recommend using Google Flights to research and purchase airfare. Trains from the Zürich airport to Lucerne depart hourly at 15-minutes past the hour, from morning to late evening. Tickets can be purchased at the station. The journey takes about 1 hour 10 minutes. 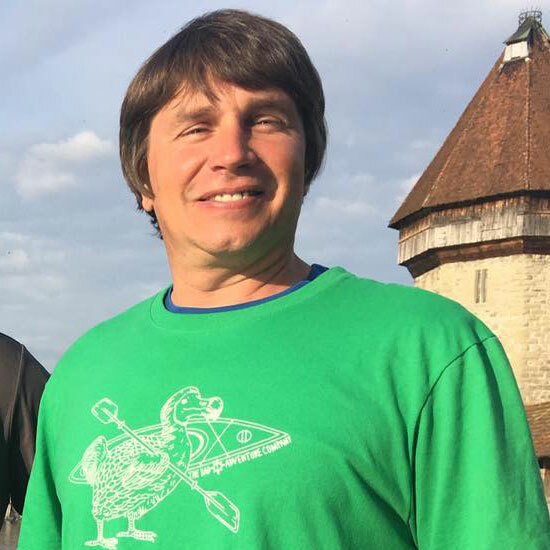 Our guide, Doug, will be happy to meet you at the Lucerne train station, but you'll need to let him know which train you'll be arriving on. I'll share his direct contact information with you in the weeks leading up to the trip. You can also communicate this with him via the private Facebook group. Use the contact page to send me a message or pick up the phone and call 1-877-788-4787 if you'd like a hand researching your flight options. Will I be able to purchase trail snacks locally? You bet! Big hikes require fuel! We'll stop at a supermarket each morning so we can all purchase trail snacks. Take note that snacks, lunches, and dinners on nights 3 and 6 are not included in the price of the trip. How do you spell 'Lucerne'? The English spelling is 'Lucerne'. The German spelling is 'Luzern'. The city is located in the German-speaking part of Switzerland, so local signs use the German spelling. What if my travel companion isn't up to all the hiking? We're staying in beautiful cities with great opportunities for independent exploration. Your travel companion can "sit out" some or all of the planned hiking day trips and still have the trip of a lifetime! Our local guide will be happy to suggest alternate activities. What are the base elevations of the areas we'll visit? At what elevations will we be hiking? Lucerne is at 1,385 feet / 422 meters. Zermatt is at 5,276 feet / 1,608 meters. Locarno is at 656 feet / 200 meters. Our trailheads are often a bit higher than the cities we'll stay in. However, the trails we travel are at significantly lower elevations than those we visit on the hiking trips we operate in Colorado, USA. Our highest trail section on the Switzerland Hiking Sampler is likely to be just over 10,200 feet (3,100 meters). How should I pay for things while traveling in Switzerland? Cash is king in Switzerland. Credit and debit cards are accepted less frequently by merchants than in the USA and Canada. I suggest planning to use debit cards to withdraw Swiss francs from ATMs while traveling. ATMs are readily available. Just be sure to alert your bank that you'll be traveling abroad. I recommend taking out a travel insurance policy. The Bad Adventure Company LLC reserves the right to cancel trips and a travel insurance policy keeps you protected. See the Travel Insurance Page for more information. How does it work if I have food allergies, sensitivities, or dietary requirements? It’s best to contact me about your specific requirements. I’d like to extend the beginning or end of the trip, what do you suggest? Ever been to Paris? It works as a great gateway city for travel to Europe and is worth exploring for a couple of days before or after the Switzerland Hiking Sampler trip. I suggest checking out art museums (the Musee d’Orsay and Louvre are favorites), Luxembourg Gardens, and the Catacombs! 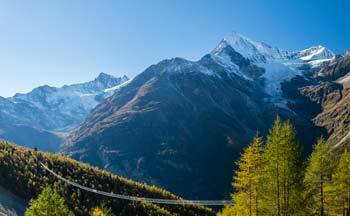 Interested in additional guided adventures in Switzerland? Get in touch and I’ll facilitate a custom trip extension through our local guide. How does paying for the trip work? You can reserve your spot by paying a $499 deposit. The balance is due 60 days before the trip. Be sure to read the complete Trip and Course Policies. There's no cancellation fee if you decide to cancel 90 days or more before the trip and we'll even refund your deposit! However, if you cancel less than 90-days before the trip, your deposit is nonrefundable. Additionally, there are significant cancellation fees if you decide to cancel your registration 59 days or less before the trip. Be sure to read the complete Trip and Course Policies. Do I need to sign a waiver to participate? Yes. Everyone who participates must agree to the terms of The Bad Adventure Company LLC Release of Liability. You must read and sign a copy of this agreement. Hello! I’m Doug. I’ve worked with Bad Adventures while owning and operating a successful guiding business in the USA for the past decade. Over the years, Matt and I have thoroughly enjoyed working together. We both believe in putting forth a quality product and creating unique experiences for our guests. I now have the good fortune of calling Switzerland home and guiding trips in this beautiful country. I strive to be more than “just” a guide. I try to be a well-informed local friend who shows you not only the tourist attractions, but also the hidden gems that give a taste of the real Switzerland. Few things give me more satisfaction than helping my guests experience a breathtaking moment they’ll remember for a lifetime. I take my responsibility as your guide very seriously. You put a lot of planning and dreaming into your trip. My job is to help you realize your dreams and to exceed your expectations!